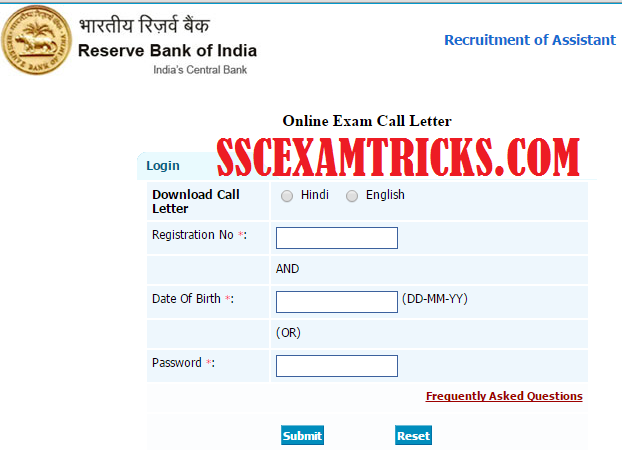 RBI Assistant Interview Call Letter 2015 Released rbi.org.in Download RBI Assistant Interview Admit Card 2015: The great news to every one who has qualified online test for RBI Assistant Recruitment 2015-16 is that RBI has uploaded interview call letter on the official website. The direct link for downloading interview letter is given below for the convenience of the candidates. The interview schedule has been published in the interview letters. To download your interview call letter, click on that link. A screen for online interview letter will be displayed. Enter your registration number or roll number and date of birth (dd-mm-yy) or password in the blank space provided in the columns. 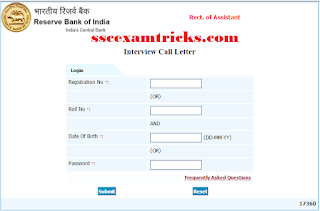 Press submit button and download your RBI Assistant Interview call letter 2015. Check out the interview date, time and venue with instruction provided on it. Read carefully these instructions and follow during interview session. Check out the image for better understanding to download interview call letter for RBI Assistant 2015. Latest News on 21.07.2015 – The Reserve Bank of India will conduct online test on 1st, 8th, 9th and 16th August 2015 at various centres across all over the country. 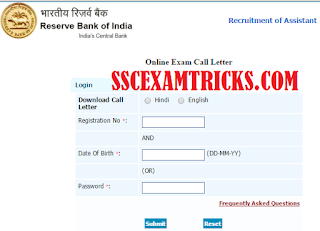 RBI has released Admit card on 21 July 2015 on official website www.rbi.org.in. You can download RBI Admit Card from direct link given below. Go to the direct link given on this page. The Admit card screen will be appeared. Enter your registration number and date of birth. Enter verification code in the blank columns given at the bottom. Click on 'Submit' button. Now your Admit card for written test will be downloaded. Check your Admit card for any discrepancy in name, father name, address etc. Note down your date, time and venue of written test. It is advised to the candidates, they should reach 15-30 minutes before time of written test. Late coming candidates will not be allowed to attend written test. RBI had invited online application from 12th June 2015 to 03rd July 2015 on www.rbi.org.in for 504 posts of Assistant for various bank offices. The last date for payment of application fee was 03rd July 2015. The final selection for Assistant Posts will be done on the merit basis prepared from online test and personal Interview. Online test will be tentatively held on 1st, 8th, 9th and 16th August 2015 at various centres. The Admit card for online test will released 15 days before online test date. Admit Card can be downloaded from direct link mentioned above. Candidates can download Reasoning tricks, English Tips Techniques, Math short cut tricks with memory techniques based on Time Management concept of read once and memorize forever. You can prepare for short cut tricks to achieve cut off marks in RBI from various coaching institutes. 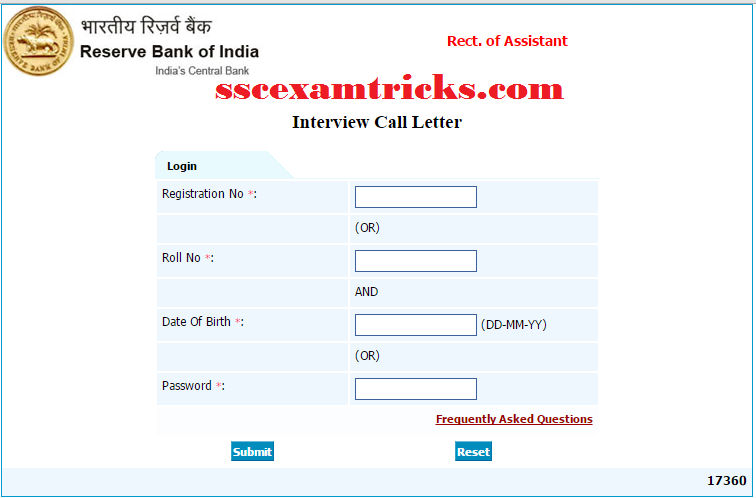 For getting latest news about RBI ASSISTANT latest jobs, admit cards, results, scorecard, counseling schedule and document verification of the candidates visit regularly on sscexamtrick.com. Furthermore readers can download tips-tricks & General Awareness questions answers sets for RBI ASSISTANT 2015 prepared from most popular books to the candidates to achieve cut off marks for RBI ASSISTANT 2015.